Many times laws written by the legislature have unintended consequences. 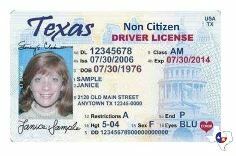 The 2011 Texas Legislature passed a law requiring the Texas Department of Public Safety (DPS) to verify proof of citizenship or legal immigration status before issuing a driver's license. The intent was to make our roads safer by reducing the number of illegal aliens driving on our roads. The reality of what has happened is far worse than just the opposite of the intention. Rather than making our highways and streets safer, we have increased lawlessness and virtually guaranteed that every single illegal alien driving a car is doing so without insurance and without having demonstrated the knowledge of driving laws and proper driving skills. In the past, at least some percentage of illegal aliens were driving with a license and insurance. Those days are gone, and your uninsured motorist coverage premiums are increasing to reflect that. Texas State Representative Roberto Alonzo (D-Dallas) has introduced a House Bill 3206 that will reverse this and make it possible for these people who are trying to work and pay taxes to be able to be responsible drivers on our roadways by having both a license and insurance. Long-time advocate for sensible immigration reform Norman Adams supports this legislation. “Texans need to demand that these people be licensed,” Adams said to QR Thursday night. “You can’t vote unless you’re a citizen so anyone who’s worried about that is misguided. Maybe we could issue them driver’s licenses that have ‘non-citizen’ stamped right on it to alleviate concerns about that." This goes to the core of one of the key areas that is broken in our immigration system and policies. We have millions of unidentified individuals walking around this country. We have no idea who they are, why they are here or what their background is. If they break laws by committing violent crimes, they can simply move to a new area and change their name. We need a system that identifies people and tracks their background to make our streets safer. Because the current law creates more unlicensed and uninsured drivers, our roads are less safe and lawlessness is increased. There are more cases of people fleeing the scene of an accident, more cases of police pursuits and much higher incidents of accidents where your insurance will have to pick up the tab for an uninsured driver hitting your car. This also means that you have to pay your deductible in an accident where you weren't at fault. Many unintended consequences that need to be fixed. Illegal immigration is a federal matter. The responsibility of the Texas Legislature and DPS in this area is to make our roads safer and drivers responsible for their actions, regardless of their immigration status. The current law does not do this and must be fixed. This bill is not perfect by any means. The legislative process needs to debate and amend this bill to make it an even stronger protection for Texas drivers. But it is a bill that addresses a real problem and it is proper that it be in this session and fully debated. Join in on the discussion on Facebook.